Virgin carbon produces the tightest grain structure possible in a steel. For this reason, it can produce a sharper edge than any stainless steel alloy. 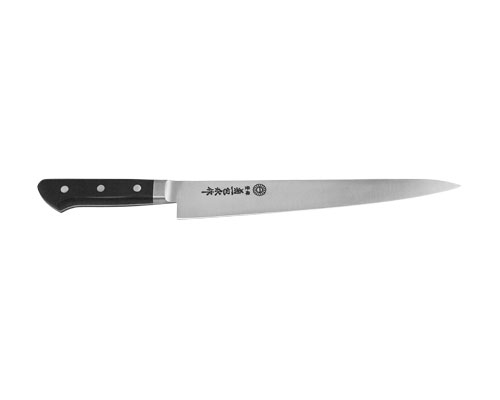 When used on meats, fish, and most produce, the edge retention is better than stainless steel. When used on acidic foods like citrus and tomato, the edge will break down faster. These knives WILL take on a patina (grey color) and WILL rust if not thoroughly washed and dried after each use. If rusting occurs, we recommend simply sponging the blade with "Bar Keepers Friend". This product is readily available at grocery and drug stores. This Kikuichi 5.9 in. 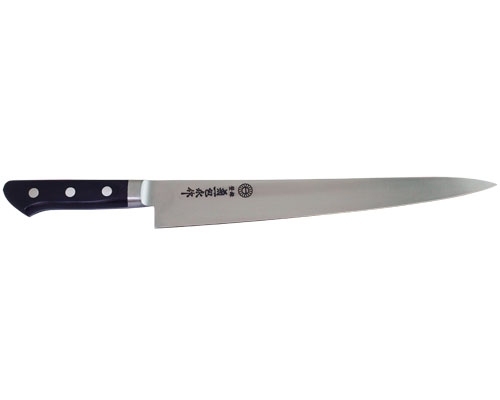 (150mm) Petty knife is an all purpose knife, perfect to use on small to medium sized items. 8.25 in. (210mm) Traditional single edged Carbon steel knife with a slight back bevel (80/20 edge). Hand finised on a water stone for extreme sharpness right out of the box. 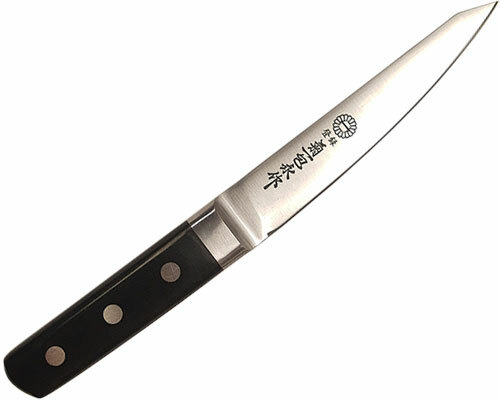 This Kikuichi 9.4 in. (240mm) Gyuto is the Japanese version of a Chef's knife. Sharpened on each side of the blade, for a western style. This Kikuichi 10.6 in. (270mm) Gyuto is a great addition to any kitchen. The Japanese version of a Chef's knife, it is a multipurpose knife, and can handle any task, like slicing, dicing and chopping. The Kikuichi Carbon Elite 4.7 in. 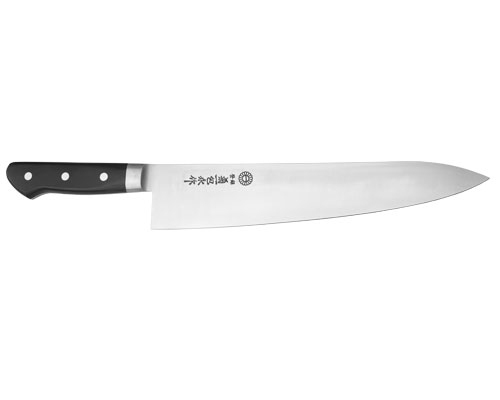 (120mm) Parer is light and a little larger than the average paring knife. Use this versatile knife for peeling, cutting or garnishing fruits and vegetables, but be careful around acidic foods, as this can cause the edge to break down faster.